Where books are concerned these days, we notice that the ‘series style’ is in vogue which right now does not seem to want to go. Where L.M.Montgomery is concerned however, she wrote her series way back in the early part of the 20th century… & her works are classics. L.M.Montgomery’s book ‘Emily Of New Moon’ has always according to me been a source of inspiration where writing has been concerned. The book revolves around the character of Emily who loses her father by age seven & is by lot adopted by the spinster clan of her mother’s family at New Moon. The story line is gentle & careful where details are concerned, making the book a wonderful read. However, children & teenagers these days don’t fancy the innocent Emily of New Moon … they prefer action packed dramas between people & creatures that are not real. The modern day fiction characters have dug the grave of many real life characters & Emily is sadly one of them. However, Emily in her sort of coma stage is still quite immortal as her life story is as real as ours….even though she is just a character in a book. Her story is constantly being repeated in society & so she though not remembered today…..can never really be forgotten. I visit many book stalls & at times I have to check very carefully whether the book I have picked is not by chance something in the middle…….middle of a series that is. Every book these days & every film as well are in ‘series mode’ & nothing is ending to everyone’s satisfaction. This only indicates that people today do not & cannot accept that everything in this world has an ending & that life cannot be continuously prolonged……..all good things must come to an end, like good classics do. I’ve always when reading the demure & introverted Emily felt that although it to is a series…..why is it so different from modern day series ? The reason I found out was that Emily describes reality which is always logical & precise…….those who enter these realms must also one day leave…..new ideas & fresh stories should come forth from an author so that an author is not typecast forever. A writer should always write new works of art so that the imagination does not get stagnant with just one plot of one saga. I admire people who go gaga over sagas as they do not get bored at all while they read the same plots over & over again but still believe that they are reading something new ! I cannot fathom their thirst for more similar literature, but I can understand that like every other human……they too do not wish their favourite story to come to an end…..& when it does, the reaction of all such readers are typical of the regular drug abuser……books are not drugs…they are panaceas of life, not over stretched dead bodies or scripts. The Emily series being a classic is however, more different in its simplicity than extravagance….the author knew where she had to end & she jolly well ended it !!! The drama of Emily’s life is unfurled very tenderly by the pen strokes of Montgomery; Emily’s dreams, wishes, imagination, friends, teachers etc., are the planets which revolve around a true classic story. The author goes also to the extreme of indirectly indicating Emily’s spelling mistakes & how they improve as the years go by………as we turn the page & get mature just like little Emily. Compared to ‘Anne Shirley’ who is a popular character among Montgomery books , Emily is very impulsive but also very secretive like all artists are. Her child like emotions are at times not so child like if the reader sinks deeper into the storyline. Many situations in the book are quite similar to ‘Anne Of Green Gables’ but the personalities of both the protagonists are different & this difference has been maintained by the author throughout the book which still can capture the readers attention. It is a profound work which captivates a reader where dialogues & emotions are concerned. There are also many ironical parts in the book, none greater than the last chapter where Mr. Carpenter (Emily’s school master) actually mocks Emily’s poems which to us seem outstanding. Indirectly, Montgomery indicates to the reader that poetry is quite a subjective concept which can only be understood by tuning in on the emotional side of the verse. Many other short stories or tales are carefully introduced into the manuscript by the author like the tale of Isle’s mother, Cousin Jimmy’s sad accident, Teddy’s peculiar mother etc., all which add to the central theme, not diverting our attention. These short incidents are wholesome which digests into the reader’s system. These characters are shadowy however, & much of their descriptions portray them to be people who have been hurt physically, mentally & even emotionally in the past. Emily’s ‘descriptions’ throughout the narrative at times makes us laugh & at other times makes us ponder over our own hidden phantoms. 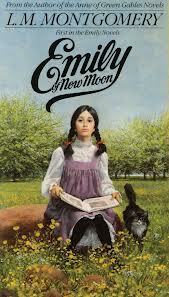 Like Anne of Green Gables, Emily too makes quite a few mistakes but…they are fewer in comparison. All in all however I must conclude that ‘Emily Of New Moon’ is a classic which can live on as we grow up….day by day….minute by minute……second by second. Anne of Green Gables, Pollyanna and Emily of New Moon are books that all little girls should read…wonderful post!